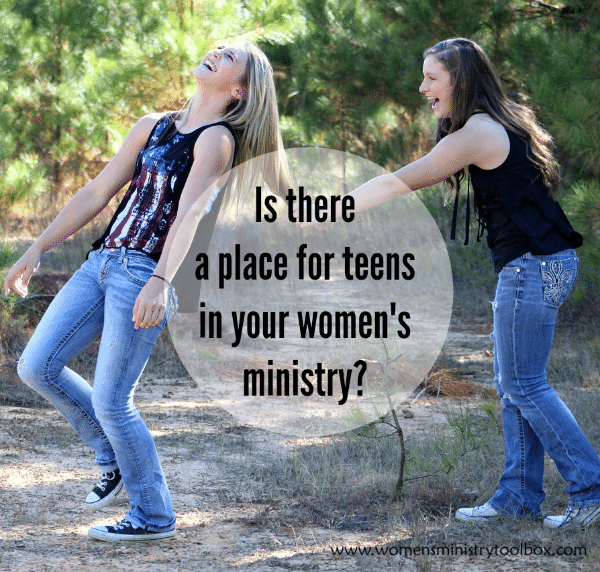 Is there a place for teens in your women’s ministry? The future of your women’s ministry is meeting down the hall in the Youth Room. Yep, those girls down the hallway on their phones will soon graduate and will be checking your “women’s ministry”. Are there things your team could be doing right now to plant the seeds so they’ll want to participate? But God knew it was where I needed to be. I can now say honestly, that I love working with Youth. So much so our whole family spent the week at Youth Camp this summer. I see the value now in including our teen girls in women’s ministry. We need to make women’s ministry something they feel part of before they ever graduate. If they see women’s ministry as a closed door, they may decide it’s not one worth opening. Invite them to participate in missions projects. Our Youth girls were invited to come and help out with Operation Sandwich in the spring. Personally invite them to come to the women’s ministry banquet or conference if the topic is appropriate. Enlist their help with decorating for events they are invited to. Consider asking them to serve as hostesses. Hopefully they’ll leave excited and interested in participating in women’s ministry. Offer a Bible study geared toward teen girls. Create a Beauty Bootcamp or Spa Night for the girls. Share make-up tips, give manicures, etc. Host a Fashion Show where modesty reigns. Bring in a Christian Image Consultant (find one here) and learn about the latest fashion trends and tips together. Hold a Computer and Social Media Workshop. Gather some tech-savvy teens to teach it for you. I know they’d be happy to help other women set up Instagram and Twitter accounts. Serve and volunteer with the Youth. Teach a class. Chaperone an event. Host a Youth event at your home. Go with them to camp. Provide a meal. Support the Youth. Attend their fundraising events and performances. Just being present shows support and interest. Number 5, adding a Bible study for teens, is a prayer that is heavy on my heart. I’ve already shared with our Women’s Ministry Leader that I want to lead a summer Bible study for our Youth girls. I’m prayerfully reading through several books to determine what God would have us use. *Please note affiliate links included below. Any purchase you may make helps to cover the costs of this blog. Your support is appreciated! One of the books I’ve been reviewing is Project Inspired: Tips and Tricks for Staying True to Who You Are . Project Inspired is written my former fashion model, Nicole Weider. Nicole Weider is on a mission: to help young girls avoid the traps that culture sets. The trap that baits you into thinking you must sacrifice your self-worth in order to be beautiful and popular. Nicole launched Project Inspired in 2010, a website for teen girls that analyzes pop culture and explores ways girls can live in their authentic beauty. In Project Inspired , Nicole shares tips for you to stay true to yourself—to how you were created to be. With photographs, real behind-the-scenes stories from inside the fashion world, and an honest look at living a life that looks great on the outside and feels great on the inside, Project Inspired is a book you’ll turn to time and time again. Project Inspired has some great potential for a small group study! There are a total of 12 Chapters (some of which could be easily combined). Nicole is very real and transparent in sharing her struggles with depression and finding her faith and purpose in Christ. I think teens will find her stories, experiences, and advice very relatable and useful. This book covers beauty both inside and out. You may want to purchase this book for a teen in your life. You may want to consider using it as a basis for a small group study. You might even want to use it as a reference book to get a glimpse of what teens these days are thinking and dealing with. Sorry – Giveway is over! 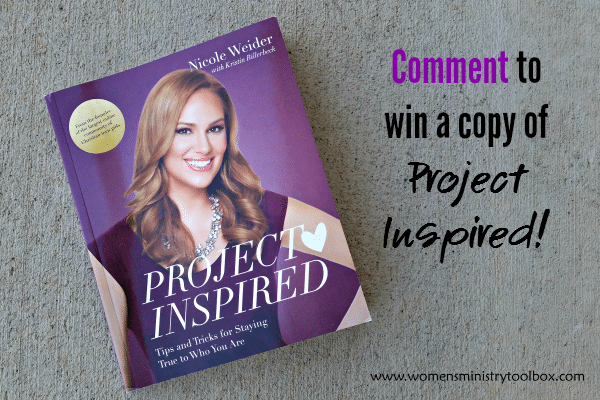 One lucky reader will win a copy of Project Inspired ! To enter to win please post a comment by Friday, September 25th at 10 AM EST. Winner will be contact via email and must reside in the U.S.
Talk with your team and brainstorm some ways you could love on, encourage, and include the teen girls at your church this coming year. Disclosure: I received a copy of this book to review and received no monetary compensation. All opinions expressed are 100% my own. One year ago: Is your ministry button stuck on repeat? Great ideas! Would love to share this book with our youth director. Thank you! We’re a fairly new church plant (2 yrs old), and don’t have teens yet; but this is definitely something to keep in mind as our current elementary age girls grow, and as our church grows. Thanks for posting this! Sandra, thank you for your comments! So glad this meets a need you already recognize in your church. Praying for you and your team as you seek God’s will in connecting with your teen girls. Thank YOU and God bless! I am so grateful for this topic. 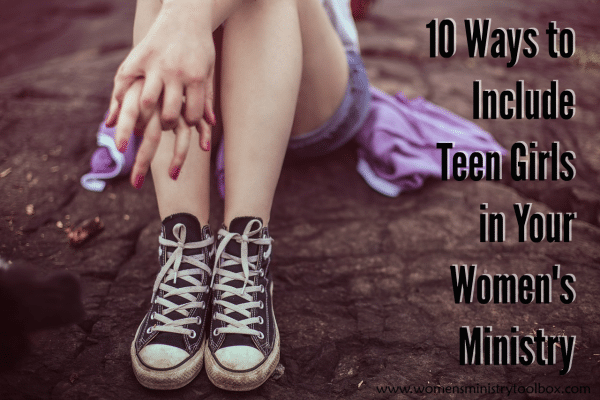 Although we have a small church with only a few teen girls, we have been wondering how to include them in our Women’s Ministry. This has been very helpful and I can’t wait to share it with the ladies. It is so needed today in the church. I enjoy your site so very much. Thank you and God bless you..